With only three days of April to go, I’m trying my darnedest to make them all “no spend days”! It’s been a tight month with the big trip to the Gulf Coast and that massive tax payment…but instead of being extra frugal I find myself spending even more. Yikes. It’s the Big Three: Amazon. Target. Costco. Had to get that dirty confession out there! I’m not even going to try justifying right now. Maybe when I do the April recap. Anyone else fall off the bandwagon every now and then?? Paid interest on a security deposit?! So we finally heard back about our security deposit at the old apartment yesterday. I originally paid $600 (or at least my work did, as they were swell enough to pay my first month’s rent and security deposit last year) and our prorated rent for April was $598, which we didn’t pay yet as we had already moved. I told them to just take it out of the deposit and send us a bill if we owed more, so that we’d at least be close to breaking even. 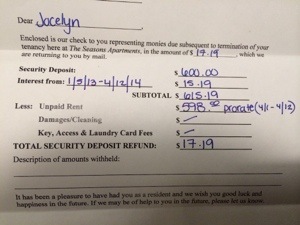 Anyone else ever get interest paid on a security deposit?! New Orleans, Wrestlemania, and a potential wedding venue! A lot of things went wrong in terms of logistics and that’s what kinda killed the vacation hotel budget. We originally had a group of 7 or 8 of us going, with most people getting in on Friday afternoon. Well, me and Mr. Bacon found the cheapest flights getting in late Thursday night, and were supposed to spend that night with one of the posse that was renting a place in New Orleans for a month or so. A family emergency meant she wasn’t there at all, and it turned out she hadn’t rented her place in NOLA yet either. SO… we had to book an extra night’s hotel pretty last-minute as we were the only ones to fly in Thursday. Another friend completely bailed, so it was down to 5 of us, which meant a larger share of splitting up hotel and travel costs. Sunday night should’ve still had 4 of us in town, but the other couple ended up driving back to Texas early, and although my best friend offered to still pay for the half the hotel room for Sunday, I wouldn’t have any of it. And I have to admit it was good to have some alone time with Mr. Bacon on vacation! The trip was for a bike ride adventure, but when it came down to just me and Mr. Bacon in New Orleans on Sunday night after the bike ride, we did what we had to do–which was go to the 30th edition of WRESTLEMANIA! Pretty insane! I don’t follow pro wrestling at all, but my fiancé has absolutely loved it since he was a little boy. I have to admit it was pretty epic being in the Superdome with over 75,000 fans screaming and yelling and booing. I even recognized some of the big names from my childhood–Hulk Hogan, The Rock, Stone Cold, Jake the Snake, and of course, The Undertaker! We scored super last minute seats for under $50 each on Stubhub.com, just 2 hours before the show. They were club seats somewhere in the middle (not the nosebleeds) that were originally $130 apiece. That was a pretty great deal! So you know, we have fun going on these crazy dates–he went to the circus with me, and I went with him to WrestleMania. In other news, we also have a huge lead on a wedding venue–one of my clients at work overheard my idea to have a backyard wedding on the Eastern Shore. He happens to have a big house on several acres there (like a summer home, kind of), and has offered to let us use it! We are going to check it out next month when our weekend schedules align. They are even doing renovations on it this year to open up walls and windows and have a 180-degree view of the water. Pretty exciting! That’s the scoop for now. Why so much, you ask? Well, I started a new job last year and ended up making much more than I had before. Over $33k more actually. But my taxes also went up about $8,400, so my take-home increase was almost $25k. A nice chunk of change that has helped immensely with paying off the student loans and consumer debt! There was a good amount of bonus money involved, and from what I gather, the bonus money was not taxed as much as it should’ve been. That’s why I owe over $2500. Luckily I’ve been planning for this huge expense since getting my W-2 forms back at the end of January. I was able to deduct some moving expenses, at least, and so my federal amount owed was reduced a bit, but then there were the state taxes. ARGHHH! So basically, my emergency fund is being nearly wiped out again. But that was part of the plan. I will grow it back slowly, and I think I’ll still be able to contribute $1500 this month to the student loans. I had really hoped I would be able to start increasing that amount (to a whopping $1900) but that will have to wait. Steady $1500 payments are pretty damn good, especially compared to no payments at all, like in February! Good-bye March! Hello, return to our regularly scheduled debt paydowns! First off I’d like to give myself a huge pat on the back for doing five posts per month since the beginning of the year. My original goal for 2014 was to do one post per week, a minimum of four posts per month. This is a huge boost since last year there were times I could only get to a single monthly update! The updated numbers: $83,813.38 as of yesterday. Yeehaw! That’s $1,452.57 down from last month (yup, back on track! ), although I contributed a total of $1741.92, $289.35 went to interest. That’s about right for interest, it’s always been just around $300. 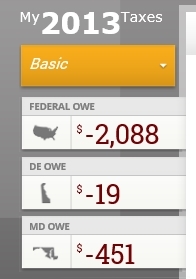 The latest paydown means 11.8% down in the total since the birth of the blog, or a whopping $11,213.49. Nice! WE MOVED–big costs included paying double rent, but also clearing out the refrigerator and filling up the new one, and random home supplies purchases. So we went over budget in groceries, which was expected in replenishing the new fridge, but surprisingly dining out was limited and within budget–probably because we were just too busy with moving to go out! II had purposely boosted up the “home supplies” budget in March from $100 to $200 knowing that we would be buying extra things for the new place. But I know there were several other purchases (too many in Mint.com categorized as “shopping”) that we went over that $200. I finally cancelled the gym membership we signed up for together back in October. Super embarrassing details in another post, but I knew it was a bad idea and totally overpriced. It cost another $150 for the early termination fee since it was a one-year contract, ouch, but at least that saves me $70 per month from here on out. We have a small gym right across from our building (literally…we can see people working out from our balcony) and all I ever use is the treadmill if I’m not running or biking outside. We went to the circus! I love the circus and hadn’t been there in probably 25 years. I know, I’m such a dork! This one was more modern and held at Verizon Center in DC, where they have basketball games and hockey games and concerts. Not the hot stinky big top tents that I remember. This was totally a last minute date although we got tickets 3 hours before the event on StubHub, two for $68 and they were in the third row! We were pretty overdue for a big date, since we were so busy most of March and February with the move, February we were dealing with buying the new car, and the last time we really went out was in January at the basketball game. Whew. Anyway, the increased paycheck and retro-pay that finally kicked in really helped with the extra expenses in March, but I also realized another source of extra income–travel reimbursement for work. Whoa! More on this later, but I’ve been having to drive to other sites for work since getting promoted, and we get 57.5 cents per mile. Suffice it to say that February driving got me $239, and March driving got me $365. That more than covers a couple tanks of gas! Our big trip to New Orleans and Florida. Yay! This weekend!! Recon missions to scout out wedding venues. Oooooh!